OK, your yearly evaluation indicates that you’re a highly qualified, effective teacher, but let’s face it—there’s always room for improvement, right? So, how can you kick things up a notch in your classroom? Ever think of incorporating some social media or music into your lessons? Or how about conducting an experiment? Encouraging out-of-the-box thinking sounds pretty cool too! All of these suggestions for becoming a more effective classroom teacher—plus 23 more—can be found on the infographic shown below. Good stuff so be sure to check it out! Thanks to Mia MacMeekin who created this useful visual and for sharing these great ideas! Check out her blog for additional infographics here! Use one or more of these strategies to take student learning (and engagement) to a whole new dimension! 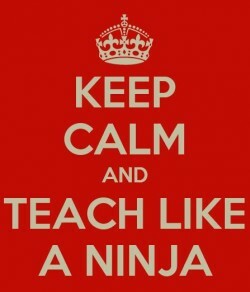 BTW—Like my “Keep Calm” image? Learn more about how you and your students can create your very own customized meme by checking out my Carry On with the Keep Calm-O-Matic Image Generator post.